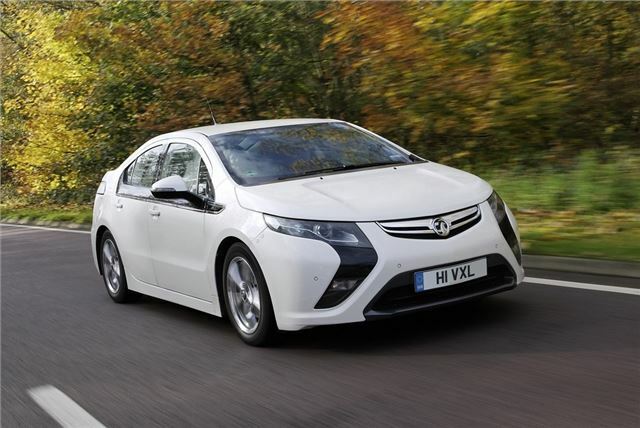 Vauxhall has announced today that its Ampera Extended-Range Electric Vehicle (E-REV) will cost under £30,000 when it hits UK showrooms in early 2012, after taking advantage of the £5,000 plug-in car Government grant. After taking advantage of the £5,000 grant, customers will pay £28,995 for the Ampera. Running costs are low with the efficiency of up to 50 miles range on battery power, free London Congestion Charge, no Vehicle Excise Duty payments and 5% company car taxation. Vauxhall claims the Ampera will bring the 'reality of a technologically sophisticated, electrically-driven, family car with an uncompromised driving range firmly into the mainstream.' A full charge for Ampera's battery can be achieved in less than four hours via a domestic 240v electricity socket at an average cost of around £1, depending on tariff. Commuting within the 50 mile range will ensure very low running costs on battery electric drive only. The Vauxhall Ampera's 50 mile battery electric drive range exceeds the UK’s average commuting distance but when a longer journey is required, the Ampera’s range-extender engine/generator produces electricity on board. The generator engages seamlessly once the battery has reached a minimum level of charge. The 50-mile battery electric range is thus extended by 310 miles permitting the driver to travel up to 360 miles without the need for recharging or refuelling. Vauxhall is also offering the opportunity to become an 'ePioneer' and be among the first to own an Ampera. For a £150 fully refundable reservation fee, potential customers can register at www.vauxhall-ampera.co.uk where they can pre-order an Ampera and also access exclusive events and opportunities in the build up to launch. There is no commitment to purchase. The same website also offers much more information on the Vauxhall Ampera and includes Facebook, Twitter and YouTube links.